Social validity (SV) is a concept used in intervention research and is concerned with the overall acceptability, relevance, and utility of an intervention to all intervention stakeholders. SV not only takes into account efficacy in respect of the pre-defined study outcomes, but also participants’ perceptions of the intervention as well as the wider social context in which it will be applied. There are a growing number of mindfulness-based educational programs (MBEPs) being empirically evaluated and implemented in educational settings. However, due to a lack of scientifically validated instruments that can assess SV in MBEPs, a systematic evaluation of SV in such programs has not been undertaken to date. The aim of this study was to investigate the psychometric properties of the Social Validity Scale of Mindfulness-Based Programs for Adolescents (Escala de Validez Social de Programas de Mindfulness para Adolescentes—EVSPM-A), composed of 20 items. The sample comprised 512 compulsory secondary education and high school students (mean age = 14.5; SD = 1.57) from three Spanish educational centers that had completed an MBEP known as the TREVA Program. The final version of the scale showed good psychometric properties and factor analyses yielded five factors: global impact-satisfaction, acceptance and viability, individual perceived effectiveness, perceived classroom climate; training feasibility, and applicability of techniques. The EVSPM-A appears to be a suitable means of assessing SV in MBEPs delivered to adolescents. Using the EVSPM-A to evaluate SV can help improve the implementation and long-term efficacy of MBEPs. We wish to express our deepest appreciation to the individuals who voluntarily participated in the project and university employees for their support with the study. LLG and AA conceived and designed the study and wrote and edited all the different versions of the ms and the final paper. DHF conducted data analyses. TS participated in recruiting the sample, and in the administration of the different instruments. WVG contributed to the writing and final editing of the manuscript. All procedures performed in studies involving human participants were in accordance with the ethical standards of the institutional research committee and with the 1964 Helsinki declaration and its later amendments or comparable ethical standards. The study was approved by the Bioethics Committee of the University of Barcelona (Spain). Dariotis, J., Miralbal-Beltran, R., Cluxtin-Keller, F., Gould, L. F., Greenberg, M. T., & Mendelson, M. (2016). A qualitative evaluation of student learning and skills use in a school-based mindfulness and yoga program. 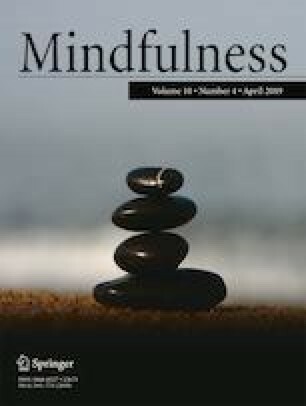 Mindfulness, 7(1), 76-89. https://doi.org/10.1007/s12671-015-0463-y. Emerson, L. M., Leyland, A., Hudson, K., Rowse, G., Hanley, P., & Hugh-Jones, S. (2017). Teaching mindfulness to teachers: a systematic review and narrative synthesis. Mindfulness, 8(5), 1136-1149. https://doi.org/10.1007/s12671-017-0691-4. Jennings, P. A., Brown, J. L., Frank, J. L., Doyle, S., Oh, Y., Davis, R., Rasheed, D., De Weese, A., DeMauro, A. A., Cham, H., & Greenberg, M. T. (2017). Impacts of the CARE for Teachers Program on teachers’ social and emotional competence and classroom interactions. Journal of Educational Psychology. Advance online publication. https://doi.org/10.1037/edu0000187. Kuyken, W., Weare, K., Ukoumunne, O.C Vicary, R., Motton, N., Burnett, R., Cullen, C., Hennelly, S., & Huppert, F. (2013). Effectiveness of the mindfulness in schools programme: non-randomised controlled feasibility study. The British Journal of Psychiatry, 203(2), 126–131; doi: https://doi.org/10.1192/bjp.bp.113.126649. López-González, L. (2010). Disseny i desenvolupament d’un programa de relaxació vivencial aplicada a l’aula. Doctoral thesis, University of Barcelona - (UB). Barcelona, Spain. Available at: http://tdx.cat/bitstream/handle/10803/2364/LLG_TESI.pdf?sequence=1. Accessed 19 March 2019. Pallozzi, R., Wertheim, E., Paxton, S., & Ong, B. (2016). Trait mindfulness measures for use with adolescents: a systematic review. Mindfulness. https://doi.org/10.1007/s12671-016-0567-z. Rennekamp, R. A., & Arnold, M. E. (2009). What progress, program evaluation? Reflections on a quarter-century of extension evaluation practice. Journal of Extension [On-line], 47(3), Article 3COM1 Available at: https://www.joe.org/joe/2009june/pdf/JOE_v47_3comm1.pdf. Accessed 19 March 2019. Sainio, M., Herkama, S., Turunen, T., Rönkkö, M., Kontio, M., Poskiparta, E., & Salmivalli, C. (2018). Sustainable antibullying program implementation: school profiles and predictors. Scandinavian Journal of Psychology. https://doi.org/10.1111/sjop.12487. Sapthiang, S., Van Gordon, W., & Shonin, E. (2019). Mindfulness in schools: a health promotion approach to improving adolescent mental health. International Journal of Mental Health and Addiction, 17, 112-119. https://doi.org/10.1007/s11469-018-0001-y. Stone, J. R. A. (2014). Mindfulness in schools: taking present practice into account. DECP Debate Edition. Available at: https://northampton.academia.edu/JacquelineStone/Papers. Accessed 19 March 2019.